The objective of WHEALBI is to strengthen bread wheat and barley production in Europe by enabling the development of new, productive varieties adapted to cropping systems that require lower inputs and which are health and environment friendly. Temperate small grain cereals are staple food for both people and animals. As a major element of an independent and sustainable agricultural economy, they represent more than half of the cultivated areas in Europe. Europe is the world’s number one producer of wheat and barley and plays an important role in international trade. Global demand is expected to increase by 40 to 50 % by 2050. To meet projected demand without increasing agricultural area, it will be necessary to increase crop yield per hectare, while reducing the environmental impact of farming practices and the need in non-renewable resources (water, energy, nutrients…). However, yield improvement, which was approximately 1 % per year between 1950 and 1990, has now slowed considerably and is close to zero – particularly in European countries where yields are already very high. To remain a major agricultural producer and contribute to the global food ‘Grand Challenge’, Europe must rely on innovation to develop efficient and sustainable varieties and cropping systems. To meet these agricultural and environmental challenges, WHEALBI will combine multidisciplinary and integrative approaches to identify, understand and utilise the rich sources of diversity locked in both landraces and crop wild relatives (CWR’s) for crop improvement. Many genetic resources conserved in gene banks will be analysed by sequencing most of the gene containing regions of the genome (exome). This will be one of the first exercises of its kind in the world at this scale, with over 1,000 wheat and barley lines studied. The same materials will be tested in field experiments and on precision phenotyping platforms. 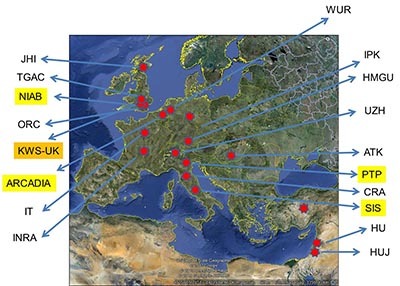 Data generated will be organised in databases that will be made accessible to the international scientific community to use and to study study, for example, (i) genome-wide signatures of selection (identification of chromosomal regions that reflect genetic progress), (ii) associations between DNA polymorphism and adaptive traits and, (iii) new variants of interest for plant breeding. Bioinformatics tools will be developed to use the datasets generated and provide tools for decision making in plant breeding. New genetic constructs (ideotypes or experimental varieties combining favourable traits for a highly productive and environment friendly agriculture, such as stress adaptation, disease tolerance…) will be tested in innovative cropping systems, particularly with low level of inputs (nitrates, pesticides), little tillage (energy savings, carbon storage in organic matter, erosion control) and organic farming.